About the same number of parents are saving for college in 2018 compared with 2016, but the amount saved has increased, and the portion of total assets in dedicated college savings accounts, such as 529 plans, has also increased, Sallie Mae reported. The average account balance in a 529 plan nearly doubled to $5,441 in 2018, up from $2,820 in 2016. 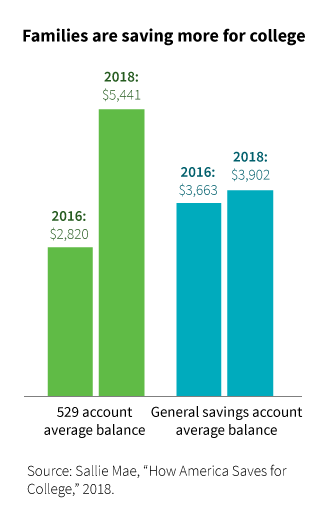 At the same time, the average amount in general savings accounts rose 7% to $3,902 in 2018, from $3,663 in 2016. Today, 529 plans represent 30% of total college savings, compared with 22% in general savings accounts. Among savings vehicles dedicated to college savings, pre-paid college savings plans represent 8% of total assets and Coverdell Education Savings Accounts hold 2%, the report found. Still, nearly half (45%) of families use a general savings account for college, while 29% are using 529 plans. While 529 plans may help families increase savings, some parents may not know about these accounts or understand how they work. An Edward Jones study found that 71% of Americans do not know what a 529 plan is, and only 29% could identify a 529 as an education savings account. Choosing a savings vehicle for college is an important first step in college planning. A financial advisor can help with planning, but only 25% of parents noted that they sought expert advice on saving for college. Many families may not be aware of the tax advantages of 529 plans. Account owners pay no federal income tax on earnings while the account is invested or when money is withdrawn for qualified expenses. Also, some 34 states offer tax incentives for 529 plan contributions. In general, families are saving more. To contribute extra money to college savings, about 18% of parents commit a percentage of bonus earnings. Others are reducing expenses or requesting contributions in lieu of gifts. And, compared to past surveys, more parents reported that they do not plan to use their retirement savings to pay for college.